Join Rachel De Barros for this beginner's crash course on how to solder - in 360! Starting with how to choose the right soldering equipment to splicing wires and easy soldering techniques, you'll be ready to take on your next wiring or electronics project. Need a gruesome centerpiece for your Halloween festivities? 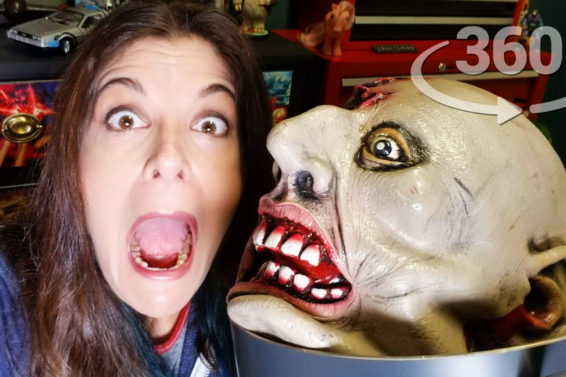 Join our 360 live stream with Rachel De Barros and chat your way through each step so you can build your own just in time for your Halloween party! Time to go high-octane with your pumpkin carving this Halloween by adding fire! But we’re not talking about those lame little votives… Grab a few household items to create amazing color fire effects that will leave the headless horseman jealous at your doorstep! Take a worn dresser from a thrift shop and turn it into useful storage for your shop – all while celebrating one of the most debated theoretical battles of all time. Who would win in a fight between Goku and Superman?